There’s no better way to recognize what a filmmaker brings to the table than a sequel without him/her. 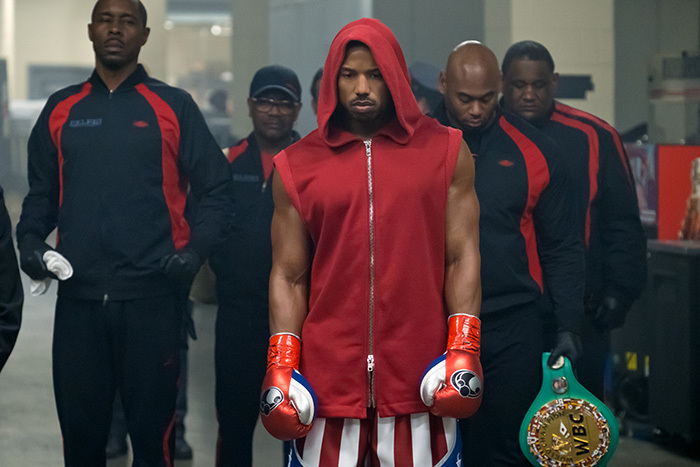 This isn’t to say Ryan Coogler wasn’t involved in the making of Creed II—he is a producer on the project after all. No, it’s simply to point out how different Creed was to the Rocky films that came before it. Yes, it was pretty much a redux of the original installment that put Sylvester Stallone on Hollywood’s map as both a leading actor and screenwriter, but it relived those beats with a depth of character and emotion that transcended the nostalgic love we have for the Oscar-winner. Coogler and co-writer Aaron Covington lent a modern authenticity that moved beyond boxing to living life itself in the shadows of greatness. Well, Stallone is back with the eighth chapter in the Balboa chronicles as writer (he was also rumored to direct before Steven Caple Jr. came aboard) alongside Juel Taylor (and from a story by Cheo Hodari Coker and Sascha Penn). It definitely feels like it too. Gone are the little moments of humanity that punched us in the gut when the suspense of victory was absent. Gone are the pangs of loss, guilt, and regret with real consequences. A rewatch of Creed placed the spotlight on one scene in particular as a calling card for Coogler. It was when Adonis (Michael B. Jordan) screwed up so badly that his girlfriend Bianca (Tessa Thompson) turned off her hearing aid and left him to confront the cost of his rage alone. Here was a moment where a character archetype generally relegated to emotional support proved she was a three-dimensional figure herself. It doesn’t matter that she eventually joins her boyfriend in London because that too was her choice to make. It doesn’t matter that we don’t see what she does in that time away either. We know by her conviction that the maneuver was about looking out for number one. She was protecting her career, ambitions, and love by not allowing Donnie to steal her identity for himself. This was something we didn’t see in the Rocky films. Adrian will leave Rocky’s (Stallone) side from time to time because she can’t face his selfish decisions, but doing so was always a reaction to him not an example of autonomy. We therefore receive an impetuous child pushing away those he cares about and who care about him in order to follow a heavily orchestrated path falsely steeped in a sense of honor. The strings are so visible that Donnie acknowledges them aloud and still can’t quell the hunger in his gut to see it through. So he fights Drago before he’s ready and predictably gets beat up to career-ending levels of damage if not for Stallone’s pen providing him the luck necessary to rehabilitate for an equally predictable rematch. The only stakes are therefore Adonis needing to learn that he must box for himself and not his father’s legacy or the Drago’s bullying. It’s the same lesson he learned three years ago and this one’s hollow by comparison. So how do you compensate for a lack of originality without a Coogler to flip the script and make it appear like we’re seeing something fresh? Well, the filmmakers decide to go the additive route with a goal hinging upon deflection. They put a child in Bianca’s belly to tug at our heartstrings because now Donnie has a daughter to leave fatherless if he dies in the ring. This baby unfortunately also relegates the strong Bianca into a footnote like Adrian before her. Donnie decides to fight Drago the first time without consulting her and she says nothing. He acts like a brat with Rocky and she ignores it to move to LA and pursue her career (the script rendering this change of scenery selfish rather than empowering). All the work that built her character up in Creed is undone and replaced by a superficial reflection. To compensate for losing her (and Rocky since he’s relegated to sage wisdom with only a generically parallel subplot about his own poor parenting skills to buoy the fact that he could be revealed as a ghost only Donnie sees without changing much), Creed II leans on the Dragos. This actually isn’t a bad idea since the toxic masculinity that lives inside Ivan in Rocky IV possesses some real dramatic weight when projected upon an abused son indoctrinated with the desire to reclaim the family’s status as Russian sports royalty. This is sadly squandered, though, since Stallone and company never goes far enough to manufacture anything but a missed opportunity. There are countless instances where Viktor shakes his head as though his father’s programming is glitching out. It happens when he’s told to “break” Adonis, opening his eyes to the error of that command instead. But maybe I was seeing things because nothing comes of it. In fact, the exact opposite of what you’d expect occurs as far as who blinks first. It gets even worse, though, when you discover the target of their ire: Mom (Brigitte Nielsen). She becomes a symbol of Ivan’s failure and thus the sole entity with which to impress by having Viktor succeed where he couldn’t. Or at least she’s supposed to be a symbol because all I saw was a taunt. The film gives her two scenes with which to purely exist. Every woman in this film becomes a pawn. They represent past (Nielsen and Phylicia Rashad’s Mary Anne Creed) and future (Thompson), becoming stand-ins for the insecurities of boys pretending to be men. Rather than expound on this idea, Stallone, Taylor, and Caple Jr. brush it aside as fuel for those men to punch their way towards clarity. These interesting themes are present only to be squandered for the pure entertainment we had come to expect from the Rocky franchise before Coogler demonstrated how they could offer more. The fights are brutal and suspenseful and the acting stellar across the board, but it’s not enough to disguise the fact that it’s a house of cards. While that reality used to be okay, I expected more this time around. Creed II is now in wide release.